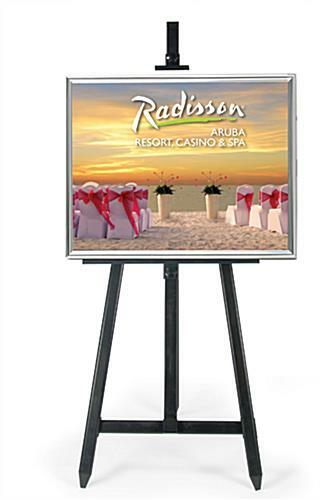 These advertisement displays, poster frame easels are perfect for displaying 18" x 24" graphics! These poster frame easels are constructed from solid, durable and strong steel. Our poster frame easels feature (2) adjustable clamps to hold displayed materials securely on the easel. These poster frame easels, also known as art displays, feature (1) silver-finished plastic poster frame. The poster frame fits 18" x 24" size graphics. The graphic will be protected by a clear lens to prevent from being damage from occuring. These poster frame easels feature a simple and attractive design to accentuate any environment. These poster frame easels stand at 70" tall, reaching most customers' eye level. These poster frame easels can be used to advertise poster frames and other material as well, such as bulletin boards, light boxes and dry erase boards. These poster frame easels feature a sleek and contemporary design, making them appealing to the public! Click here to find out more about this frame display easel. 18.0" x 64.0" x 21.0"